Home / Entertainment / Arts/ Dmitrii and Izabella: A perfect combination for the season! Dmitrii and Izabella: A perfect combination for the season! Following the success of Russian Classical Ballet in Colombo, the Russian Centre in Colombo proudly presents back-to-back classical events in the year of 2018. As a concluding seasonal note for the year, two world renowned Russian artists will be arriving at the Pearl of the Indian Ocean for a classical music experience of a different calibre for local audiences to witness. 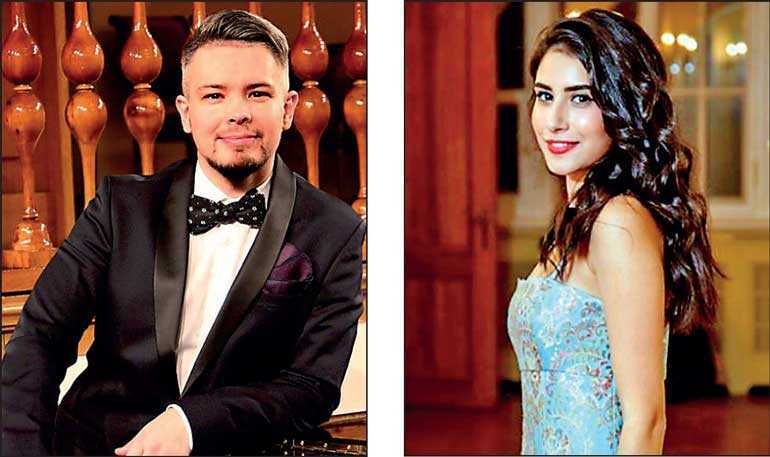 Dmitrii Miachin and Izabella Andriasian; both young and blooming in their musical careers will be at the spotlight at the centre stage of the Lionel Wendt Theatre on 18 December, at Russian Classical Music Duo in Colombo. Artist Dmitrii Miachin’s childhood had been one of music, with a parental background of musicians and choristers which moulded his future in the same form of art. His very first achievement as a pianist came at the age of nine, as he became a laureate of the regional competition of young pianists. His performances had never been bound by the borders of his motherland, but have now expanded into new horizons as he shares his gift in music with fans all over the world. As a graduate of the Piano Faculty of the N.A. Rimsky-Korsakov Saint Petersburg Music College, his achievements in this form of art include performances at The Great Hall of the St. Petersburg Philharmonic, the Small Hall of the of St. Petersburg Philharmonic, St. Petersburg State Academic Chapel, Small Hall of Glazunov St. Petersburg State Conservatory, the Great Hall of the Moscow State Conservatory, Smolny Cathedral (St. Petersburg), K. Bayseitova National Theater (Astana, Kazakhstan), Sunport Hall Takamatsu (Takamatsu, Japan), Sheremetev Palace, the concert hall of the Kazan Kremlin. In April 2018, Dmitrii’s solo debut took place in one of the largest halls in the world – the Vienna Musikverein. Izabella Andriasian; the Russian diva whose musical flair is that of a soft psalm on a Sunday morning is also a graduate of the N.A. Rimsky-Korsakov Saint Petersburg Music College. Some of her musical achievements include Grand Prix, Regional competition of performing arts soloists and vocalists of children’s musical schools and art schools of Krasnodarkrai, Winner of the Award of the Ministry of Education and Science of the Russian Federation for the support of talented youth, Award winner of III degree, 1st Open Regional Varlamov Vocal Competition and Winner of the First Prize, XI Zara Dolukhanova International Vocal Competition ‘Amber Nightingale’ in 2018. Bringing in the seasonal cheer at a more personal level, the music duo will be performing at the Lattice Lobby Lounge of Taj Samudra Hotel in its grandeur atmosphere for a passionate crowd of classical music lovers on 13 and 14 December. Brace yourselves for an experience of a lifetime as you journey through traditional and modern classical music styles in performances of solo and duets brought to life by a combination of piano and vocal abilities of the Russian Music Duo. For inquiries, please contact the Russian Centre in Colombo on colombo@ruscent.com or call us on 2685429/2685440. Only few tickets remaining; so, grab yours before it is too late! Box office open at the Russian Centre in Colombo from 7 a.m. to 7 p.m.